Prepress Departments are irreplaceable in many printing companies for a high value end product. Nevertheless, in many of these divisions, individual and tailored software solutions for administration and production controlling are missing. The printer’s ERP system often lacks specific functionality, such as prepress order management, production planning, internal communication, integration with production systems (e.g. 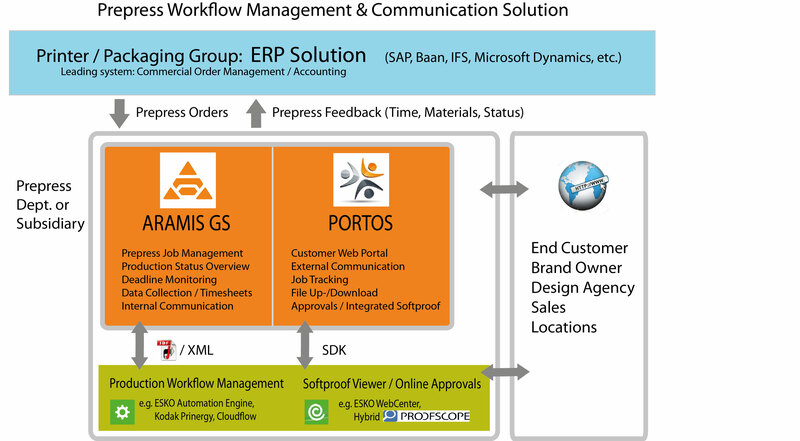 Esko Automation Engine), and external communication with the end customer, including online approval management. The combination of Aramis GS and Portos is the optimal solution for supporting these divisions. Our system can be perfectly adapted to existing workflows and integrated in the existing software infrastructure of the printing company through flexible interfaces. By introducing Aramis GS and Portos, you will receive an acclaimed software system which perfectly suits the requirements and workflows of your prepress division. Thanks to our profound industry know-how and our expertise in integration of numerous systems we are the best partner when it comes to finding a solution for your prepress department. From the first consulting talk to the system installation and First Level Support – we are always there for you! For the seamless integration of your solution into your company structures we work hand in hand with your IT division. Our experience has proven that the benefit of a professional collaboration of all divisions is tremendous. We will guide you through the process and be there for you at any time. Aramis GS and Portos come with numerous existing interfaces and a very flexible interface architecture. Apart from production systems (e.g. from Esko) further solutions from business administration, project management, inventory control and electronic resource planning (ERP) can be successfully integrated. We are open to everything new and create fast and secure connections. Call us or send us a message! We will be happy to talk to you about your individual solution with the Aramis job management!